Very high up on my list of reasons is BYO with only £1 corkage. For me, that means I can take one or two decent bottles of wine and not have to pay through the nose for the pleasure. Unless you feel you can get by with the Paris goblets they provide, you will need to bring your own glasses. Don’t be shy – they don’t bat an eyelid. And I like the informal and friendly atmosphere. Unlike many of the trendier restaurants a bit further South, which seem always to be packed with the Didsbury Set, you get many different types of people here. It seems so much more inclusive and inviting like that. Sometimes you even get a bunch of wine nuts making the most of the BYO policy and enjoying interesting wines with the food. Ah yes – the food. The restaurant describes the cuisine as “authentic Arabic and Middle Eastern”, and I have heard it described variously as Syrian and Lebanese by those who claim to know. Maybe I am not as enthusiastic about the food as many people, but I like it well enough. And I know the menu so well now I can easily navigate it to find the meal I want. Most people seem to agree that the starters are the best part of the menu, and the best value for money. For mains I like the shaworma, maklobeh, and the kebabs best – particularly the chicken kebab. I find the sauce in many of the casserole style mains not to be wine-friendly, and the one time I ordered fish it came back so over-cooked I wouldn’t dream of ordering it again. The two of us would typically order 4 starters to share, and then share one main with rice and a salad. Normally I do without dessert, but their pastries are good. See the menu on their website for details and prices. Officially they have a £15 minimum charge, but it is quite likely your bill will be less than that and it has never been a problem for me. I really like the feeling of being pleasantly surprised by the size of the bill, and wanting to tip well rather than feeling under an obligation. If I were asked for wine recommendations for Aladdin food, in broad brush terms I would suggest a Riesling of almost any style, or a spicy medium-bodied red. Chateau Musar, red or white, would also be an excellent choice. The food is subtly spiced, and not at all hot, so wine matching is usually not too difficult if you avoid the more acidic dishes. Here are a few more sources for more reviews on Aladdin: Restaurant-Guide, sugarvine and tripadvisor. Most of them seem to ring true. A couple of the comments on tripadvisor are interesting though. I too have experienced a horrendous and totally unacceptable delay getting into the restaurant, despite the fact we had booked. But it has only happened once to me – it was a Saturday and I do not usually go that day. Maybe it will happen less often now they have expanded the upstairs part of the restaurant? This entry was posted in General and tagged manchester, restaurant. Bookmark the permalink. Couldn’t agree more Steve it was a real eye opener for me. 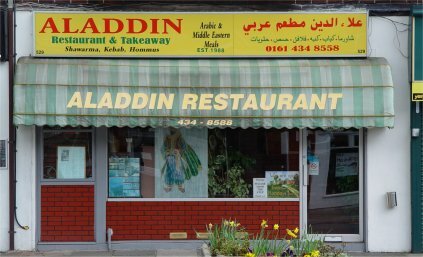 I’ve tried quite a few of their dishes and have thoroughly enjoyed every one. Good prices too! I love the place; working my way thru every item on the menu not found anything I didnt like yet! This old post had a few page views today so I thought I should check it is still relevant. It is. A while back they also took over the ground floor of next door, but it has not impacted on the quality of the food or service. The atmosphere is a bit different in the new bit, but that is all. We still eat there regularly – yesterday was the last time.